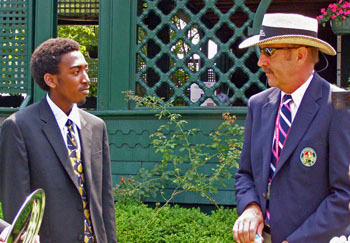 The grasscourts of the ITF Hall of Fame in Newport, Rhode Island, and the museum that houses the honorees, are a prestigious monument to the game of tennis. I had visited the museum previously, but this was my first trip to a Hall of Fame Induction, the Campbells Championships and the Bill Talbert Junior Sportsmanship Award ceremony. I had a chance to watch some matches on Friday and visit a bit with former college players John Isner and Kevin Anderson (was it really just a year ago these now top 100 ATP players were playing against each other in college events?!). It was Saturday that is the big day in Newport, Rhode Island, as the day began with the official luncheon for past and present honorees before the prestigious Bill Talbert Sportsmanship Award was presented to juniors Alison Riske, Michael Sicora and Evan King. The three were thrilled to be among the Hall of Famers, which included Stan Smith, who told Evan that his son (now the Duke men's coach) Ramsey was once a recipient of this award. The award winners and their families then got to spend the entire day at the same festivities as all the other honorees. The fourth player to receive the award was Alexa Glatch. I heard from her a few days before that she had made the very difficult decision to play the Stanford WTA event instead. Alexa, who is a professional, has been fighting her way back up the rankings since suffering from two broken arms and, while the Hall of Fame does have a men's event, there is no women's so attending would cost her a week of important play (and she had received a wildcard into Stanford). Alexa did not in any way take the honor lightly and said, "I am extremely honored to receive the Talbert Award. While there shouldn't have to be an award just for doing the right thing, I really appreciate being recognized as someone who always tries to do just that." The Hall of Fame Induction was a memorable event as the youngest French Open champion Michael Chang, tennis great and Tennis Week publisher Gene Scott and IMG founder Mark McCormack were inducted. Michael Chang was gracious and emmotional as he accepted his award, as were John McEnroe and Monica Seles, who spoke about the postuomously inducted Gene Scott & Mark NcCormick. I left to drive back to New York (and catch a plane to Florida for the National Claycourts) before the finals of the Campbells Championships. 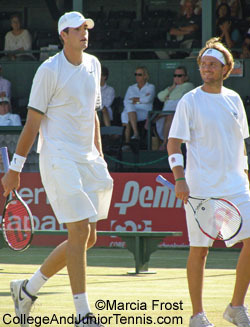 Congratulations to John Isner & Mardy Fish (left) on their doubles championship. I was really impressed on Friday (they got to skip a day before the Sunday final) with the teamwork of these two and I have a feeling we are going to see them pair-up more often. 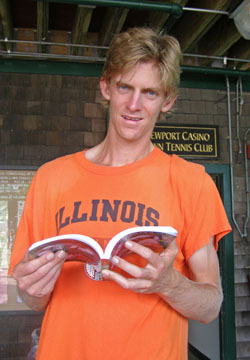 I already gave my best wishes to Kevin Anderson (right). Kevin not only had a good tournament to be proud of -- losing heartbreakers in singles and doubles in third sets -- but he has recently been named to the South African Olympic team, an honor he is thrilled about. 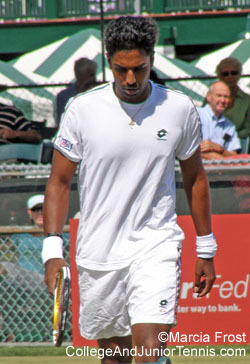 Prakash Amritraj (below) son of three-time Hall of Fame Championships winner Vijay Armitraj, a former top national junior player who went to the University of Southern California before deciding to play professionally under his father's Indian flag, was the tournament's singles finalist, losing to repeat champion Fabrice Santoro.